2 Bedroom Upper Floor Flat For Sale in Sheffield for £120,000. 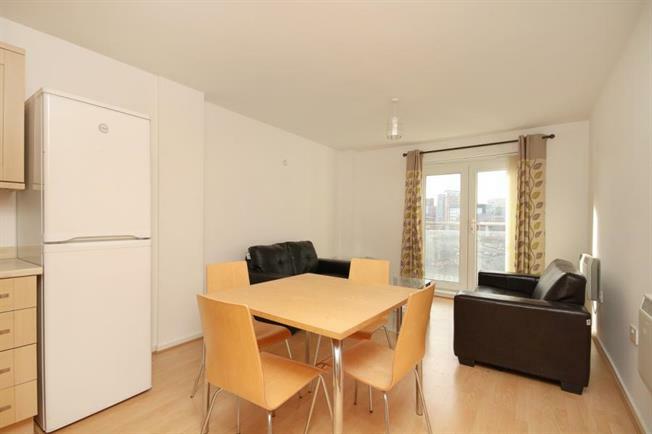 Offered for sale is this lovely two bedroom apartment situated within the Coode building. This apartment is currently being sold as vacant possession, with furniture also negotiable for inclusion. This is a very bright flat with a juliet balcony and stunning views looking towards the Kehlam Island district. The kitchen includes wood affect units, integrated oven and white goods, and the bathroom is a contemporary three piece suite, with white tile throughout. What's more you'll benefit from; electric heating, secure intercom access and double galzing. Coode is situated within Millsands, essentially next door to Kehlam Island and very close walking distance to the City Centre. In this popular location, you'll have a lot of amenities close at hand including; the real ale pubs of Kehlam Island, public transport, both Sheffield universities and an array of shops, bars, restaurants and cafe's within the City Centre. If you're looking for City Living, this could be the best place to start. Property briefly comprises; entrance hall way, lounge / Diner with clearly defined kitchen space, master bedroom, single second bedroom, bathroom and storage cupboard. For further details, and to arrange your viewing, please contact branch.